So you've woken up and the world has ended. Yikes, this should be interesting. They are coming up with excuses but long story short, there was an outbreak and half the world's population are zombies. The reporters are not saying the biochemical plant upstream had anything to do with it but the reporters aren't saying that the plant didn't have anything to do with it either. Some people hide up and wait but they aren't going to be the ones surviving. You've got a chance, though. You've prepared for this! 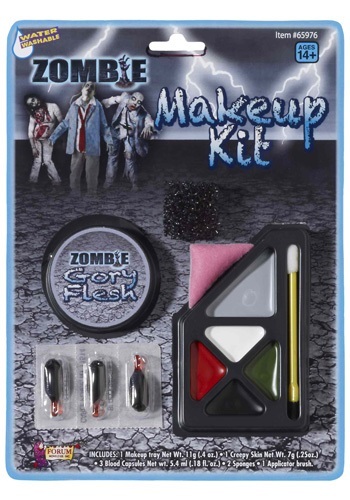 Without thinking you pull out your Gory Zombie Makeup Kit, transform into the living dead and go scavenging for food. You've prepared for this moment, waited for this moment and by gum, your make up has never looked as good! Huh, we bet you never thought that facepaint would save your life, did you? Well, good luck, just be sure to check corners before barging into any buildings.